Several Montreal clubs are under fire this week after installing water cannons that attack homeless people that are on their property. “I think blasting homeless people with an industrial strength water cannon is in bad taste,” says urban planner Bigwell Grandy. “Just because drenching the downtrodden with a torrent of freezing cold water isn’t illegal doesn’t mean that it’s ethical. It’s not." It might not be ethical but spraying homeless people with water is an increasingly popular technique that many establishments throughout North America have begun adopting. “We didn’t come up with this idea ourselves,” says Melanie Bertrandelle, the president of the Montreal Alcoholic Society, an institution that represents 45 clubs and bars across the city. “We were looking for help in dealing with the homeless problem plaguing many of the business we represent when we discovered the Indigent Dispersal Cannon. This is a system of internet enabled water cannons that are operated by the San Francisco Religious Foundation. The way it works is that automatic censors trigger the moment a homeless person is suspected of being on a given property, which then sends videos to a list of SFRF volunteers who determine whether or not there’s a homeless person on your property. If there is, the volunteers turn on the hose until the homeless people run off. It’s a brilliant system." Jeeves Vondersmidt, a spokesperson for the SFRF, says that their cannons are doing gods work. "15% of the proceeds we make on the cannons goes to funding Christian iPhone apps that spread the gospel," says Jeeves. “Our Indigent Dispersal Cannon makes it a breeze to cleanse your property of the filthy unwashed vermin that god hasn’t gotten around to smiting. Not only that, but when you buy one of our systems, you help fund soul saving iOS software. It’s a win/win situation." Jeeves says that the SFRF invented their Indigent Dispersal System in order to manage all the homeless people who kept trespassing on to church property in the Bay area. “San Francisco is very expensive,” says Jeeves. “So we have a lot of homeless people who don’t realize that they’re unimportant. Our water cannon helps them realize that even God doesn’t care for the homeless." Irvin Meloche, the proprietor of the St-Denis bar Mamelon Atomique, says he doesn’t regret installing the devices. “I think the SFRF are a little crazy,” says Irvin. 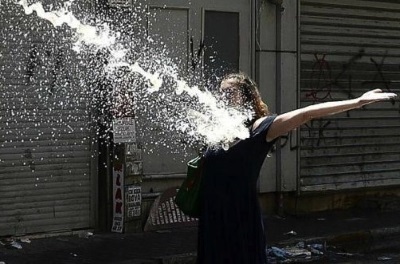 “But their water cannons really work. I sympathize with the plight of the homeless, I really do, but my club isn’t a hotel for the indigent. It’s for paying customers. In the past, my establishment has suffered considerable property damage at the hands of homeless vagrants. We tried getting city hall involved, we’ve called the police, we’ve spoken with politicians, and none of that has changed anything. Last month, one of our uninvited guests spread their feces all over the handles of our front door bar. We caught them on video. Should we tolerate that?" Bigwell agrees that it’s not fair to club owners to handle the city’s homeless problem on their own. “Montreal needs to invest more money and resources into helping get people off the street,” says Bigwell. “I don’t fault these club owners for being frustrated with the city’s inaction, but that doesn’t excuse the extreme measures that they’ve taken. Soaking homeless people with water cannons isn’t right." Jeeves disagrees. “Hosing the homeless isn’t just the right to do,” says Jeeves. “It’s our moral duty. We need to teach the poor that their poverty is a sign that god hates them."